We arrived in San Francisco and took the train into town. Our hotel was located next to the Trans America building and in a good location. After dropping off the bags we went for a walk around the city. First we visited the famous Lombard Street: one of the curviest streets in world. It was full of tourists taking pictures and the top and bottom, as well as them driving their hire cars down. From here we straight down to the water and the harbour. Various street performers engaged the crowds as we walked along the shore. We passed through Fishermans Warf and down to Pier 39. Here we explored around the pier area and some food and too much wine. 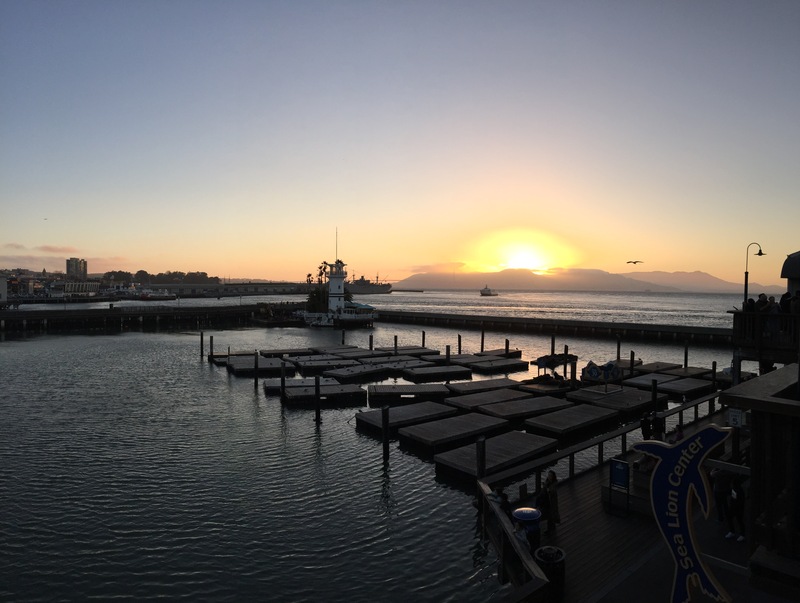 We watched the sunset over the Golden Gate Bridge and watched the Sea Lions playing and lounging around the harbour. From the pier it was only a 20 minute walk back to the hotel through the Italian area and passed Washington Square Park church. The next day we had a lie in and got ready for our trip over to Alcatraz island. First we walked down to Pier 33 passed Coit Tower. Built in 1933 to remember Lillie Hitchcock Coit who left money to city on her death to beautify it. 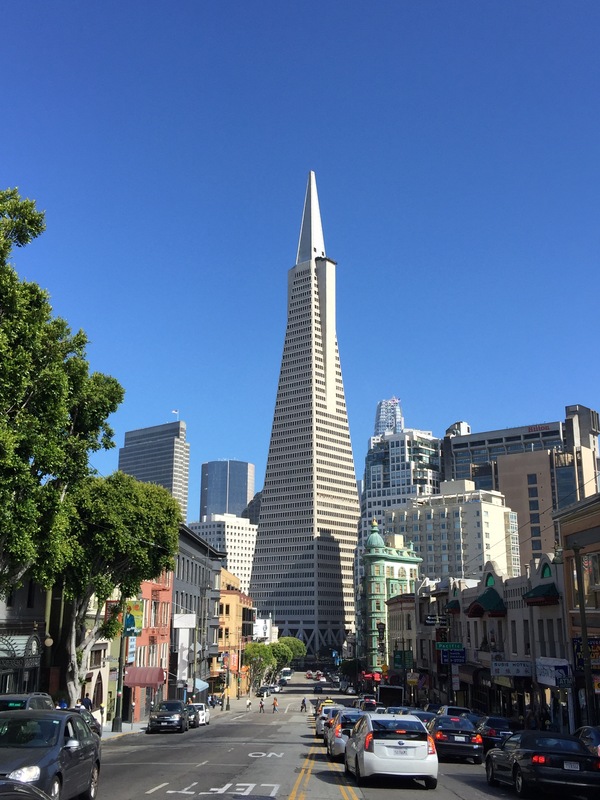 The 64m tower stands on Telegraph hill so looks much taller from a distance. The view from the tower would have been good if it wasn’t for the fog. After some photos and break from climbing the stairs we descended to the shore. At pier 33 we found some breakfast and waited for our 12pm ferry to Alcatraz. The ferry departed every half an hour but it was very busy and a good thing we booked online months ago. The ferry departed on time and we rode up top taking photos of the view on the short 20 minute trip. 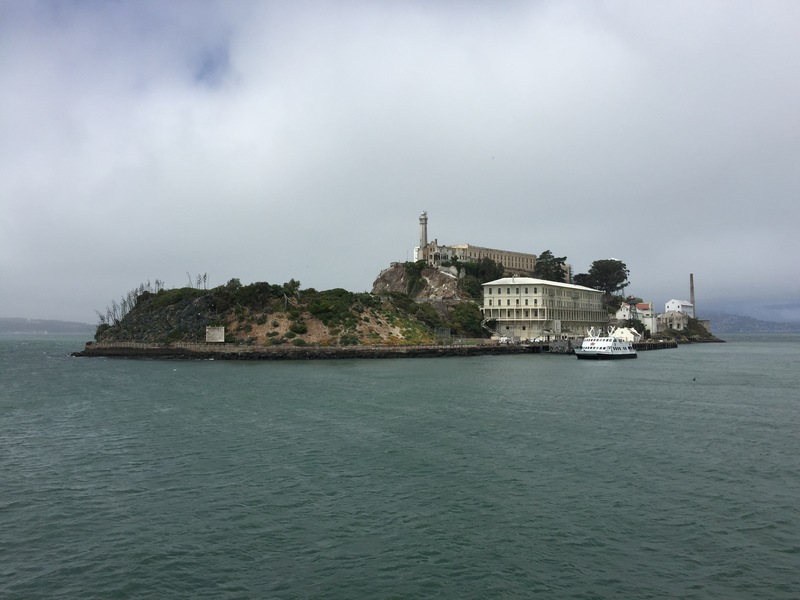 The boat docked on the island and the infamous Alcatraz penitentiary sign stood proudly over the crowds; as well as the Indian graffiti from the 1960s occupation. Our first stop was up the hill to the cell block to do the audio tour. The tour starts in the prisoner showers and then up the stairs to the cells. The audio tour was excellent and told by former inmates and guards. It gradually guided you around the cell block, past famous inmates cells such as ‘The Bird Man’, ‘Al Capone’ and ‘Machine Gun Kelly’. We were guided around the lanes of cells the inmates named things like ‘Broadway’ and ‘Times Square’ and learnt about the attempted escapes and the famous successful one. Late on the night of June 11 or early morning of June 12, inmates Clarence Anglin, John Anglin, and Frank Morris tucked papier mache heads resembling their own likenesses into their beds, broke out of the main prison building via an unused utility corridor, and departed aboard an improvised inflatable raft to an uncertain fate. Photos and records lined the walls to tell the story as well as first hand accounts over the audio. We took time posing in cells pretending to be inmates, looked through the visitors glass into the cell block and explored the control rooms and wardens office. 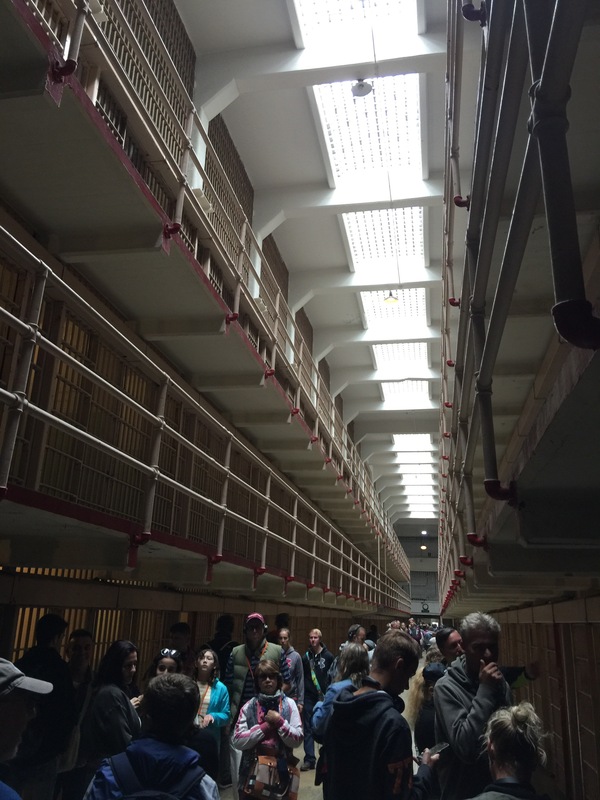 At 2pm there was a live demonstration of closing and opening the cell doors all at once. An employee pulled a large lever and fiddled with several knobs and all the cell doors opened to a clang the reverberated around the silent cell block full of people with headphones on. Then again when she closed them. It was a sound familiar from films. The audio tour led us outside to see the now burnt down wardens house and views of San Francisco and the Golden Gate Bridge. Once the tour was over we walked around the island ourselves to the exercise yard passed all the sea birds who now frequent the island and to the old workshop. In the old workshop was an exhibit telling more stories of prisoners and daily life as well as a photo exhibit of the day the prison closed. We headed back to the main building and watched a short film that explained the history of the island from its roots as a fort during the civil war to the Native American occupation during the 60s. The island explored we jumped back on the boat and headed back to the mainland. We found a hot dog stand and tucked in but needed an ice cream as well. Which was delicious, and one of the best we’d had. That evening we headed out for some drinks and had dinner at a small Italian place. The drinks lasted quite a while into the early hours which meant hangovers followed the next day and meant we wasted it slightly. On the following morning we departed but first went via the Golden Gate Bridge to take pictures. 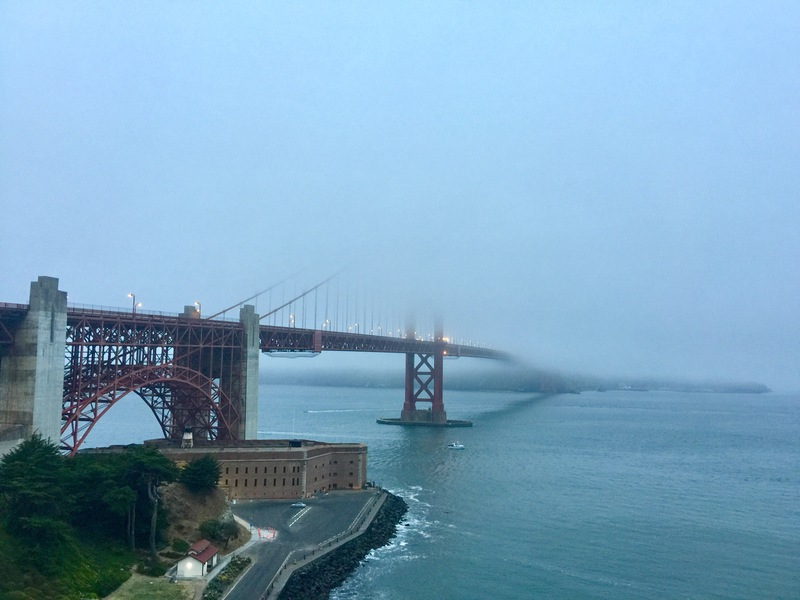 It had been foggy the entire time we’d been in San Francisco – we hoped it would finally lift on our final morning, but alas it the fog was still thick and we could barely see the bridge. We hoped in a Uber and got the airport ready to head to Seattle and pick up our hire car for our rod trip across America.